Summary: In light of the remarkable rise of right-wing populism in Germany and its growing presence in parliaments and discourses, the volume contextualizes and compares the growth of right-wing populism in Denmark, Norway, Sweden and Germany. 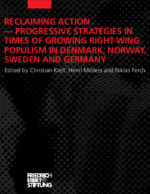 Based on the identification of ideal-typical strategies applied by progressive parties towards right-wing populist parties in the past and in the present, the authors evaluate the success of various strategies and develop recommendations for progressive and sustainable actions. Published by FES Nordic Countries.